Babe Ruth was one of a kind, a man difficult to deal with as a colleague, yet adored by the masses. It was even reported that a man "died from `excitement' while watching Babe Ruth at bat in 1920." He was born in Baltimore, Maryland in a neighborhood called "Pigtown," along with seven siblings, only one other, his sister Mary, survived. Things weren't easy when he was a youngster. His mother died of exhaustion at the age of 39 and he was sent to St. Mary's where he learned tailoring and, best of all, learned the game of baseball from Brother Matthias. Babe was the kind of kid who was nothing but trouble from the get-go, but his sports ability would take him far. Jack Dunn, talent scout of the Orioles signed him on to play ball and the rest is history. When he was sent to Boston he tended to be an annoying show-off and "his Red Sox teammates did not much care for him," but the man could play ball. He could whack the ball out of the park when homeruns were merely an oddity. His behavior wasn't going to change and at one point he even hit an umpire. Going, going, gone ...he was sold to the Yankees. Reform wasn't exactly Babe's middle name. Yankee Stadium may have been "The House That Ruth Built," but even after the Yankees won the World Series for the second time, all those promises Ruth had made to himself didn’t work as he "was once again drinking heavily, eating gluttonously, and spending money on extravagant amusements." Was Babe Ruth ever going to change? This is an excellent young adult baseball biography that would even interest an adult audience. It was well researched and the smooth flow of the book held my attention, making it a natural page turner. There are numerous photographs, sidebars, statistics, tributes from fans, a chronology, timeline, an excellent glossary, a bibliography, an index and further recommended reading resources and web sites. 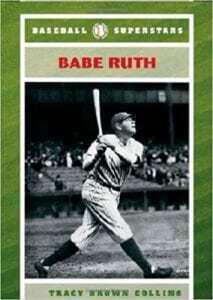 Quill says: Interesting to both youth and adults, don’t miss Babe Ruth if you’re a baseball fan!